Getting a new dog is a fun and exciting experience, and one of the first decisions you’ll face is coming up with the perfect name. I don’t know about you, but I find the process of choosing names overwhelming. Finding a name that sounds good and fits your dog’s personality is hard enough — but finding one that the whole family agrees on can be really tough. If you’re looking for the perfect name for your new dog you’ve come to the right place. To help you out on your dog naming journey I’ve compiled a list of popular dog names. From old fashioned dog names like Lady, to mythology inspired names such as Apollo, this list has names for a variety of tastes. 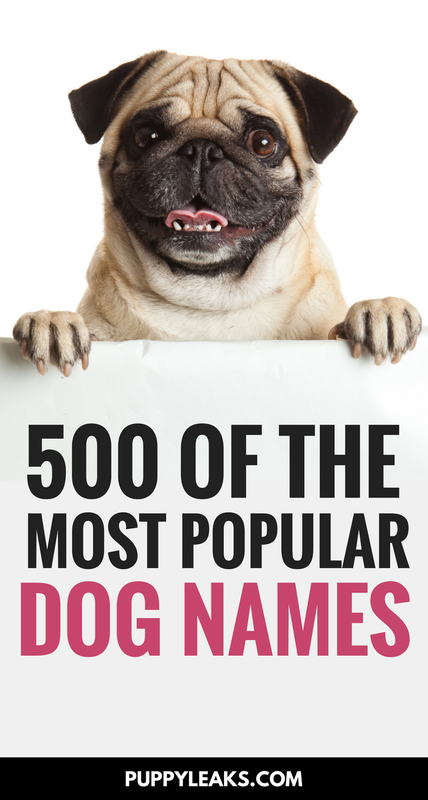 Here’s a list of 500 of the most popular dog names. How did you end up naming your dog? Do you stick to names that fit your dog’s personality? When it’s time to name your new dog do you start checking out baby name lists, or is it just me? How many times have your name ideas been vetoed by your family? Laika is named after a Russian stray dog who became the first mammal to orbit Earth. Luckily my boyfriend is into space so I didn’t get vetoed on that one. But before that? I think I got vetoed by my family at least 10 times before we settled on the name Carter. The post 500 Of The Most Popular Dog Names appeared first on Puppy Leaks.